In Week 8 last season, Smoky Valley defeated Chapman, 43-12. The Vikings rushed 47 times for 355 yards and ran the ball on all but four snaps. Kyle Anderson paced Smoky Valley with 19 carries for 200 and four scores. The Vikings eventually finished 9-2, while the Fighting Irish went 1-8. Nearly a year later, Chapman is one of the state’s biggest stories. The Fighting Irish returned virtually all of their key players from a 2017 team that suffered multiple close losses. Of the team’s 234 yards against Smoky Valley last fall, 197 came from non-seniors. Chapman has started 5-0, ended long losing streaks versus Wamego and rival Abilene and won the North Central Kansas League for the first time since 2007, also the program’s last winning season. 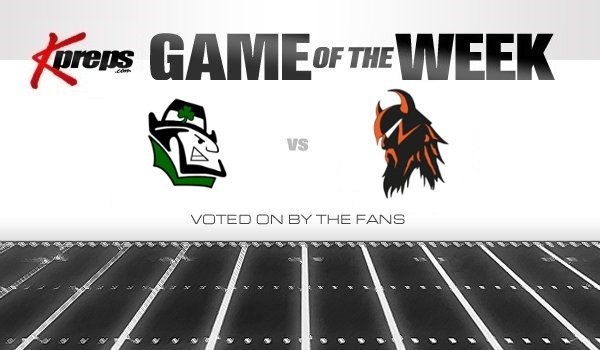 On Friday, the Irish travels to Smoky Valley (5-0) in a matchup of power run squads that could decide the top-two spots in competitive Class 3A, District 5. Both teams are 2-0 in district play. Both teams rank in the top-seven in Kansas for rushing yards per game, according to MaxPreps’ statewide lists. Chapman has averaged 346 rushing yards a contest, while Smoky Valley is at 331. “This is going to be a very fun game if you are a football fan,” Webster said. Smoky Valley graduated Anderson, who rushed for 1,436 yards and 1,371 the last two falls. The Vikings have five seniors starting on the offensive line, with four returners. Chapman senior quarterback Izek Jackson is expected to play after he missed last week with a muscle injury. Senior slot/defensive back Anthony Wasylk, a team leader, has a concussion and will not play Friday. Senior fullback Dalton Harvey enjoyed 33 carries for 203 yards and three scores versus Abilene. He leads the team with 118 carries for 758 yards and nine scores. Smoky Valley coach Tim Lambert labeled Jackson and Harvey “special” players. “Coach Webster’s philosophy is very similar to mine,” Lambert said. Lambert, a Smith Center alum, is 189-83 in his third stop after successful stints at St. Francis and Concordia. Led by the power run, he led St. Francis, a struggling program, to 15 straight winning seasons in 16 years. He went 2-7 in his first fall with the Vikings before 8-3 and 9-2 the last two seasons. In the previous two years, Smokey Valley averaged 5.5 and 5.4 yards per carry with Anderson carrying a heavy load. This gall, the Vikings are up to 6.7 yards per rush behind a three-headed senior attack of tailback Tim Lambert, Jr., quarterback Lane Schrag and fullback Cort Elliott. Smoky Valley has just one turnover and is plus-eight in turnover margin. Schrag has stepped in at quarterback and passed for five scores against no interceptions. He has 42 carries for 370 yards and six scores. Elliott has tallied 84 rushes for 408 yards and four touchdowns. Lambert, a breakout star last spring with records at the state track meet, has 87 rushes for 654 yards and five TDs. Lambert, Jr., the coach’s son, is 6-foot-2, 170 pounds. He had spent some time at receiver in the past and entered this year with 10 career catches, along with 102 rushes for 488 yards. Coach Lambert said his son has “always been pretty fast,” but struggled with weight and yards after contact. Lambert is the fourth-oldest child and oldest boy in a family of six kids. “That, along with his speed, he will get it up in there and get some tough yards, so that’s been his greatest improvement, and we didn’t see that until we started practice this fall,” he added. The offensive line features Ethan Wampler (6-2, 265) at left tackle, and Konrad Peterson (6-1, 240) at left guard. Both players earned high recognition as a junior, including first team all-state Class 4A, Division II for Wampler on the offensive line. Jon Burks (5-9, 210) returns as the center, and Nate Grosland (6-2, 280) is the right tackle. The new offensive line starter is senior Wyatt Reid (6-2, 190) at right guard. Senior Blake Heble has played well as a blocking tight end. Ben Elliott is the line coach in the multiple I formation offense. “They have just done a super job,” Lambert said. Chapman counters with its big line led by junior Kel Stroud (6-4, 265) and his brother, senior Kobey Stroud (6-1, 250). Junior center Zach Ferris (6-0, 225) and senior Erik Woodbury (6-1, 215) are also starters up front. Eight starters returned on both sides. Chapman has three assistants with previous head coaching ties and all coached in the Mid-Continent League at one point. Irish athletic director Clint Merritt, also a Smith Center graduate and former head coach at Osborne and Hugoton, is on staff this fall as the defensive coordinator. Brian Sweet coaches the defensive line. Former Chapman coach Tom Smith leads the offensive line. One of Webster’s first moves when he took over Chapman was to bring Smith on staff and have an old-school mentality. Smith was the last Chapman coach to win league before this fall.